Introducing you the latest dual 18650 batteries kit from iJoy-Captain PD1865 with Wondervape RDA. 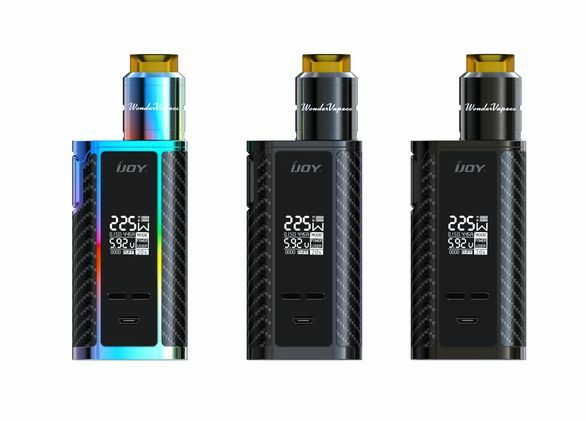 The mod body adopts the same design of ijoy Captain PD270,comes with a bright and big size screen while it keeps a compact size, very easy for your daily carry. It supports NI,TI,SS temperature control and TCR function, features a unique custome user mode, usb port charging function. A firmware upgradeable function enables you to experience latest function it has. The wondervape RDA comes with a rounded internal top cap, helps to avoid a sharp edge when you are using it. The tank itself has 2 airflow, one from the side,one locates in the bottom, to provide vapers tremendous vapor production. The deck is equipped with philips head screws, esay to fix coil builds and has a longer lifespan. The whole contact including pin are gold-plated, ensuring a well electricity conduction. If you were happening to look for a kit which is suitable for daily vaping, the Captain PD1865 with Wondervape RDA is the one you cannot miss! Don't forget to use "AHG15" to have a 15% off discount. Win iJoy Captain Subohm Tank! 8 winners!